We all have mental health. Just like physical health, we don’t all have it in equal measure and the level above or below our personal norm varies with time and circumstance. We cannot “always look on the bright side of life” for ourselves or those we care about or for. It’s the same with spiritual health. What is spiritual health? One definition is “having compassion, the capacity for love and forgiveness, altruism, joy, and fulfillment. Religious faith, values, beliefs, principles, and morals define your spirituality.” In simple terms it is what stirs, motivates, moves and drives you. It is the inner you that makes you you! Physical, mental and spiritual health are different streams though coupled. Sheds are (IMHO) wonderful places. Shedder’s interdependency and willingness to help each other creates the spiritual atmosphere and the working ethos. Achieving that in a Shed involves some effort, continuous learning and adjustment as Shed dynamics change and evolve. It is a job of work:-). A job of work that most Shedders join in with without realising. In our Sheds we try to value everyone for the contribution they make or would love to make if they could. In a good Shed, people know they are valued even when banter appears to insult them! 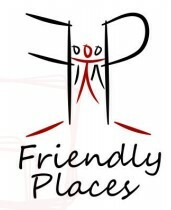 SAMS signed up to The Friendly Places charter of an organisation called FaithAction. The charter is aimed principally at churches and church groups but it applies equally to any group in which relationships are the driver. 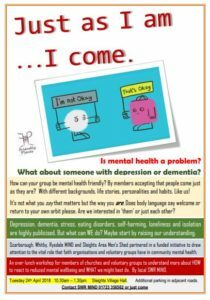 ON TUESDAY 24th APRIL there will be an event at Sleights Village Hall relating to a joint project that Scarborough, Whitby & Ryedale MIND and SAMS won funding for through a joint initiative of national MIND and FaithAction who promote the Friendly Places scheme. Work has been undertaken over the past 18 months and the project is in its last few months. The event in Sleights feeds into that with people having their say on mental wellbeing in table discussion (with lunch!). Hit the poster to enlarge. Now for Don. He’s just sent an email describing his feelings about SAMS. He lives a half life between Leeds and Grosmont. So in addition to Sunday I have two days that are mine! Wednesday when I go painting with my artist friends and Thursday which is my ‘Shed Day’. What I plan to do when I get to the ‘Shed’ and what I end up doing is all part of being at Littlebeck Chapel or Littlebeck Shed all as I have come to know it. The plan will usually be to take a watercolour or drawing to finish. The reality will be helping carry some wood, talk about motorbikes to Mick or something else redirecting me. With one hour work in watercolours still in my bag, I make the teas or do some washing up. Now I’m distracted by watching one of the guys whose been commissioned to make an artist’s stool, I ask, “Can you make one for me?” I’m told straightforwardly to go away!! Its all part of a day I find totally relaxing, doing ‘stuff’ and being involved without the stresses and stains of daily life. Keep doing what your doing Littlebeck, whatever you’ve got needs bottling.